One of our favorite on-line backpacking communities is High Sierra Topix. One of their members posted this report from the northern reaches of Yosemite. And there is enough snow here to convince you that while it may be a light snow pack---there is still lots of snow! "We skied along the Sierra crest in northern Yosemite last week. 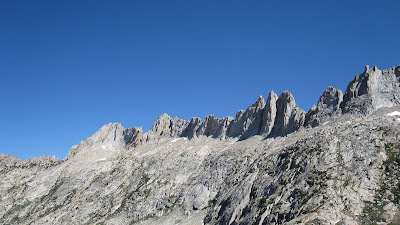 We traversed along the north side as far as Little Slide Canyon then crossed over and looped back around to the south. Snow coverage was good though it looked to be more like June than April. South aspects were somewhat bare, but way more snow than we've been seeing in the southern Sierra." "View so. from near summit of Twin Peak"
And just for comparison, here is a photo from our trip to the same area a couple of years ago.